It’s been a busy day today. By now, I’m sure you’ll have noticed The Armchair Gooner has a new address. Hopefully, such a thing will spell growth and a bright future for this here ol’ drivel I produce. 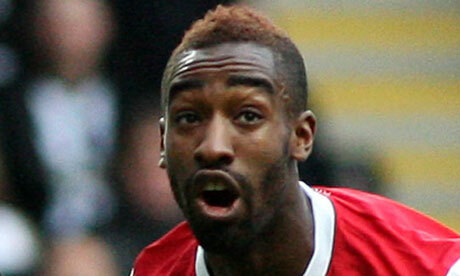 “My situation at Arsenal is not easy,” Djourou told Swiss website 20 Minuten. “I’ve never played so little and especially not in my own position. If an interesting offer comes, I’ll look at it carefully. In all honesty; I’m not that big a fan of Djourou. Barring the 2010/2011 season in which Vermaelen was largely absent, his tenure at the club is litany of errors and looks of sheer terror on his face. He has potential, that is unquestionable, but, like him, I think that potential may be easier for him to realise elsewhere. I wouldn’t be disappointed if he left and we brought in another centre-half. The player I’ve said I really want at Arsenal, Yann M’Vila, might not be headed our way at all, if you believe what you read. Instead, Arsene has turned his attention to Manchester City’s Nigel de Jong – a good player, undoubtedly. The rumoured stumbling block is the fee Rennes are likely to demand, and our usual parsimonious attitude in the transfer market. Having said that, as soon as a story of frugality emerges, one soon follows claiming we’ll spend big. Mis-information is everywhere. You never really can know where the truth lies, until it’s confirmed by someone/something official. That’s all today, folks. Just a quick tester to ensure everything is working well with the new site. Once I’ve ironed out all the kinks, I’ll be back to blogging thoroughly and on a daily basis. My last word today, is one of thanks. Daniel Cowan, writer of the excellent ‘North London Is Red‘. is the reason I have a new site and address. I’m hopelessly inept when it comes to site design and servers – that stuff is all gobbledegook to me. Daniel’s offered me his time and his technical support, and I thank him greatly. If the rumour say +15m it’s not true……..if the rumour says 10-15m, it’s probably not true………if the rumour says 5-10m then it is posibly credible…….if the rumour says <5m, read on……..if the rumour says free, get that name on the back of that shirt! Sorry Johan but the reason is you are too unreliable.